Know the warning signs! 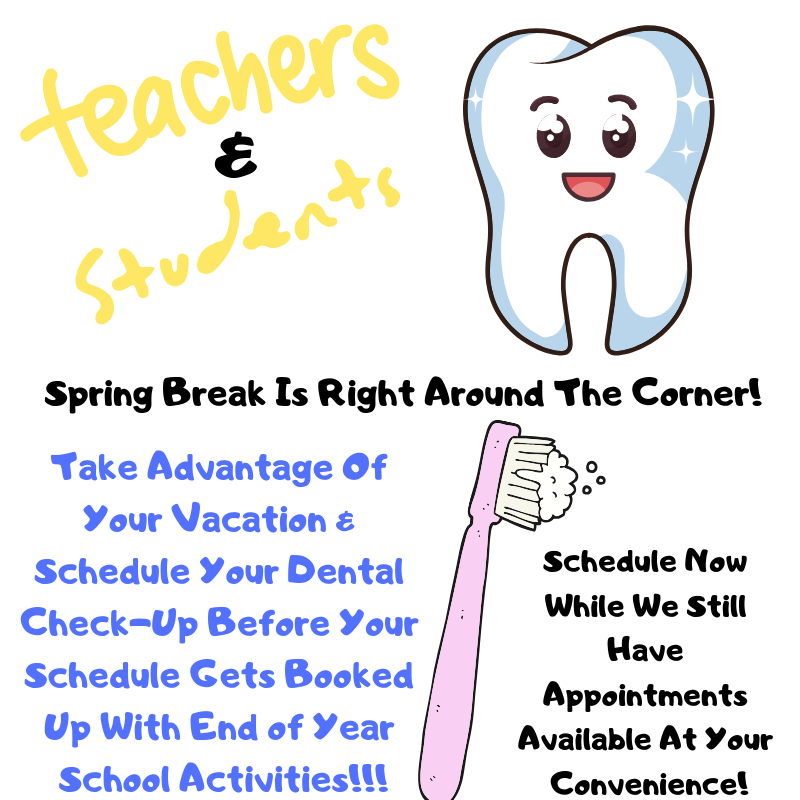 Springbreak Promo Inside! Spring is in the air and we couldnt be anymore happier! We want to let you know that we appreciate your support. Thank you for trusting us with your family's smiles. Thank you for all of your referrals; we consider them the highest compliment of all. We welcome new patients so please let your colleagues, friends and family know. Don't keep us a secret. Forward now or use button below. P.S- Get 50% off your oral cancer screening in honor of April being Oral Cancer Awareness Month! Valid for 30 days for a total cost of $20! 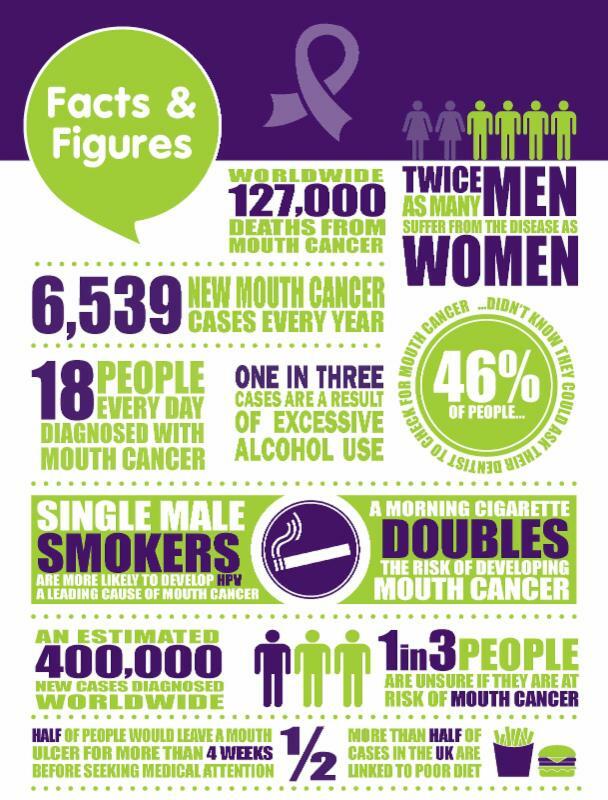 GET EDUCATED ON ORAL CANCER! 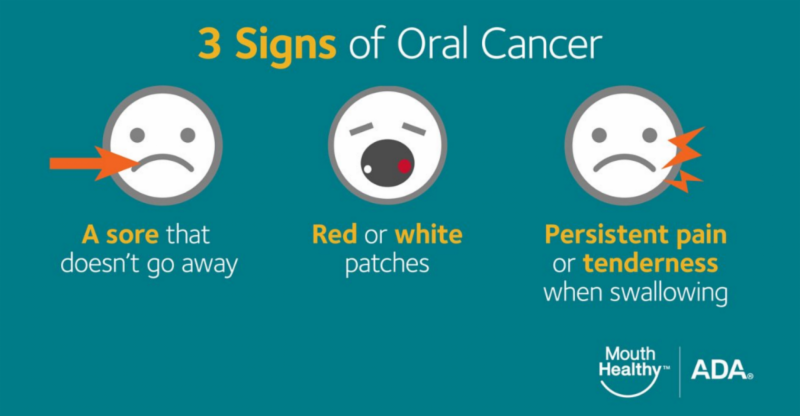 April is Oral Cancer Awareness Month, and oral cancer screenings are a routine part of dental examinations. During your exam, we will carefully examine the inside of your mouth and tongue. What starts out as a tiny, white or red spot or sore could be the sign of something more serious. Although most spots or sores are harmless, harmful ones often look identical. Oral cancers that are found early offer a better chance for successful treatment-making oral cancer screenings one more reason to see your dentist regularly. As part of your daily oral hygiene routine, watch for changes in the soft tissues of your mouth especially sores that don't heal within two weeks. Avoid heavy alcohol use. (The combination of tobacco use and heavy alcohol use is estimated to cause the majority of oral cancers diagnosed in the United States.) Avoid exposure to the sun which can increase the risk of lip cancer. 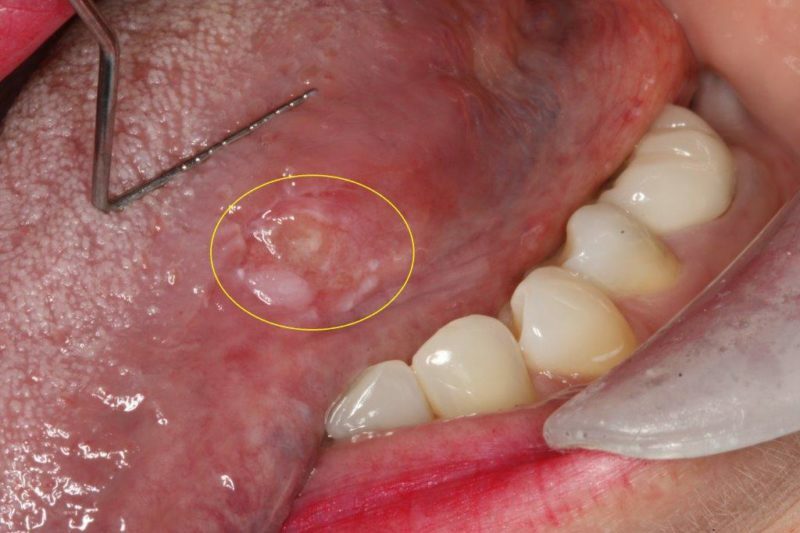 Visit us for regular oral cancer screenings that may save your life. Book My Oral Cancer Screening NOW! Early Detection Starts At The Dentist! Remember, for the entire month of April all Oral Cancer Screenings are 50% Off! ﻿Tell Your Friends and Family! Click Here To Watch Dr. Oz Perform An Oral Cancer Screening! ﻿There ARE ONLY A FEW DAYS LEFT to enter in the drawing! Refer a friend, family member, or co-worker and you could win a Family Package To iFly Atlanta!!! Beyond 3 referrals you will be treated to dinner for 2 at an upscale restaurant for each referral. In addition you will enjoy VIP Status benefits that will give you 15% off products and services for one full year. To keep VIP status, you must send us at least 3 referrals that becomes patients each year. You will also be entered into the drawing for a Family Package to iFly Atlanta! Drawing held VERY SOON! ALSO, KEEP A LOOK OUT FOR WHAT WE ARE GIVING AWAY NEXT JUST IN TIME FOR SUMMER. IT KEEPS YOUR DRINKS ICE COLD. YAH WE KNOW, YOUR WELCOME. We have listened to your feedback and have made some tweeks with our vendor for appointment reminders. Once you reply to the initial reminder, you will stop receiving further reminders for your scheduled appointment. However, you will still receive the reminder 2 hours prior to your scheduled appointment, a text (if we have your cell phone number and have opted in) otherwise an email. We request your feedback regarding these changes as we want you to be as happy as possible with our service! We'd like to share a big THANK YOU with all of our patients for passing along the word about us to your friends, families, and colleagues year after year. You're part of the reason we're able to keep doing what we love to do...."Creating beautiful, healthy smiles to last a lifetime!!!" Many people come to us seeking treatment based on recommendations from people like you, who know us and trust us after enjoying positive experiences with our office and our treatment. All health care professionals depend on the confidence their patients; referrals are the best illustration of our patients' satisfaction with our work. THANK YOU for your continued support. We really appreciate it!